Windows' own disk cleanup tool is not really suited for removing the majority of traces and temporary files that are created constantly on your system. While it cleans some, it ignores many others which is why third party cleaning solutions are used by a lot of users of the operating system. CCleaner is the uncrowned king of cleaning tools at least when it comes to popularity. PrivaZer on the other hand is a contender to the throne. I have reviewed the application twice in the last year, but today's release of PrivaZer 2.0 was reason enough to take another look at the application. If you compare the interface of CCleaner and PrivaZer, you will probably come to the conclusion that PrivaZer's is not as streamlined. The developers of the application have tried to overcome the complexity by integrating basic user and advanced user modes in the application. One of the main changes in PrivaZer 2.0 is the new basic user interface that has improved how the in-depth scanning interface looks like in that mode. Before you can go there, you have to make the usual selection during start. You can install the program or run it as a portable version. Here you select also if you want to use the basic or advanced interface, or skip that step to go straight to the main scanning interface. The main scanning page has not changed that much. You find your user level at the top now and can click on it to switch between basic and advanced user settings on the fly. I'd recommend you switch to advanced user here as that will get you access to the advanced options. The option to clean portable versions and custom user profiles of web browsers is provided here. Supported are Google Chrome, Firefox, Opera, Chromium, Comodo Dragon, Comodo IceDragon and SRWare Iron. Once you have made your scanning selection here, e.g. an in-depth scan of the computer, you are taken to the new basic interface if you click on ok. Even though it is called basic, you will be presented with a selection of items that the program suggests to scan. They are all selected by default, but you do have the option to uncheck some of them before you hit the scan button. It is again possible to switch to the advanced user interface with a click for even more options and control. I highly suggest you check the create a restore point and save Registry boxes in the lower right corner of the screen that are available in both interfaces so that you can restore any of the changes made by the clean up if something goes wrong. 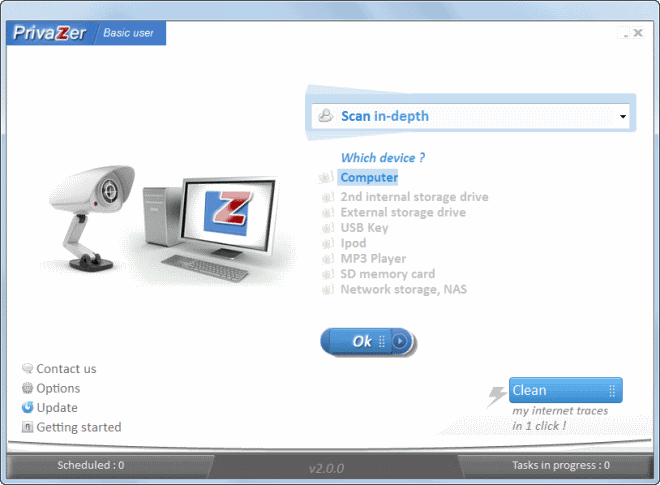 The scan may take a while to complete depending on a number of factors including your computer's current state and performance. You can configure PrivaZer to clean up all traces automatically for you, or, which I suggest you do, review them before that happens. To do so, simply click on an entry on the page to review all findings. This opens a new window with the results of the scan. What appears to be missing is an option to uncheck some options from being deleted. If you click on the clean button you get options to do a normal, quick or turbo cleanup which not only differ in the time it takes to complete the process, but also in how additional traces on the system are handled. PrivaZer 2.0 ships with several other improvements, many of them related to how cookies are cleaned and handled in the program. The developers have improved the program's cookie management feature, the import of the cookies exceptions list, and several clean up modes related to cookies. Other new features include improvements for Google's Chrome browser, like the ability to clean stored passwords or the download history. PrivaZer 2.0 includes useful improvements that make a great program even better. The program feels more complicated to use than CCleaner which may turn off inexperienced users even though they can usually just run the cleaner without reviewing the clean up options or making selections manually. Advanced users on the other hand may find that PrivaZer is an excellent program that provides them with many options that others do not. You can add custom locations though in advanced mode. I don’t want to add, I want to remove/block cleaning some files. It really works and gave me a chance to play with MozBackup which I used for some intuitive reason yesterday to backup a profile from a portable version of Firefox running on RAMDisk. RAMDisk–interesting tool for the year. Privazer–and I know better, but everything was gone from my browser–passwords, etc. Back to MozBackup–Phew! All passwords recovered without an overwrite of anything essential like a bookmark. Impressive, self-guided tech lesson today. Always thankful regardless of tone. Are there portable versions of web browsers? How do you get hold of them? There are. You can visit portableapps.com as a start for instance.